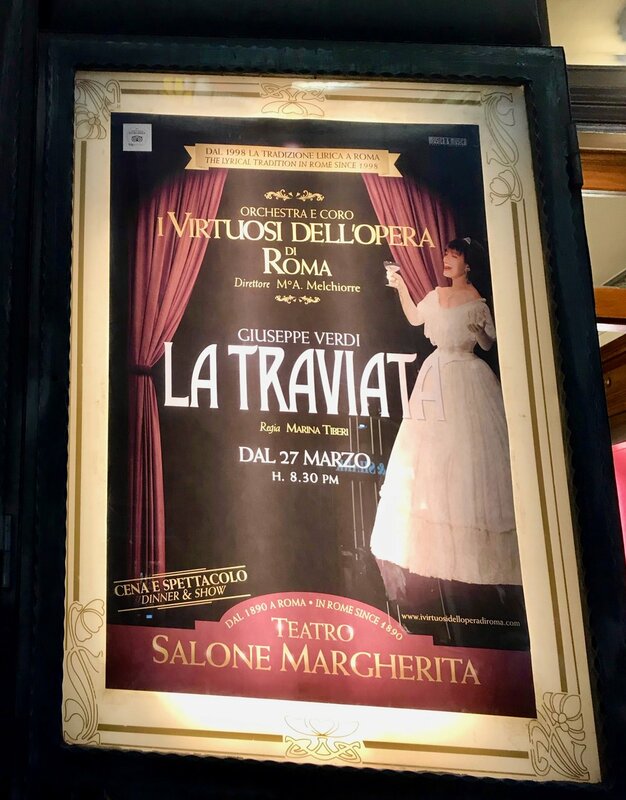 Last weekend I had the pleasure of attending my first opera in Italy, La Traviata, in the center of Rome at Salone Margherita. I dressed up, grabbed my date, had dinner before and managed to stay up way past my bedtime to see this beautiful show on a warm spring night in the city. It was a magical experience and I think it’s a perfect activity to plan for any trip to Rome. I was invited to attend by the opera company I Virtuosi dell’opera di Roma, a private concert organization supporting lyrical opera in Rome. They host several shows across the city (in both Salone Margherita and Chiesa San Paolo) and have more independence as a privately run organization. For anyone considering attending the opera in Rome, I’d love to share about the venue, this specific show, my general experience, who I think this opera would be a good fit for and more specific info for anyone interested. 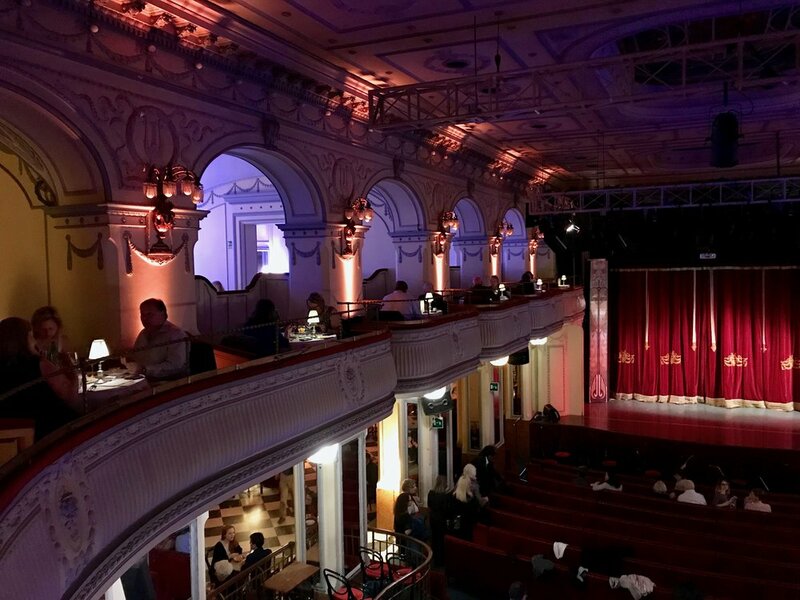 Set in the center of Rome near Piazza di Spagna and Barberini (near the Spagna and Barberini metro stops), this historic theater was built in 1890 and has recently undergone restoration. From the street, the theater looks quaint and infinitely instagrammable, while inside the moody, romantic decor takes you back in time. Before the show started I explored the theater, which includes a bar at the front open to everyone, two bars for refreshments off to the side of the stage, a lower level of seats and couches in front of the stage and a second level with dining options and “box seats” overlooking the theater. Our seats, in the front row of the second section, provided a great view of the stage but if you’re interested in watching the orchestra, you’d need to sit in the front section. A unique aspect of this theater is the ability to dine during the show. The box and balcony seats include a gourmet meal with antipasti, a first course, second course and dessert, while the lower-level seats include a pre-show buffet with pasta. I loved this venue because heading into the center of Rome, near all the famous monuments, to a small, intimate theater made my experience much more memorable. It’s not as famous as the Teatro dell'Opera di Roma, but the smaller size meant we could see all of the performers well and the acoustics were fantastic. This organization also hosts shows at a second venue, La Chiesa di San Paolo, which is stunning, larger and has great acoustics as well. I’d never head of La Traviata, or “The Woman Who Strayed” before, which is not surprising given my lack of knowledge and experience with the opera. The show is based on a French novel and the tragic story of a courtesan and the man she falls in the love with over the period of her short life. The main character, Violetta, was played in last week’s performance by Sabrina Testa and her co-star, Domenico Tegliafilo, played Alfredo Germont. All of the singers were fantastic, but my favorite may have been Tegliafilo’s portrayal of Alfredo, if only because operas sung by Italian men are my fav. Highlights definitely included the costuming, with gorgeous 19th century French gowns and outfits, the talented opera singers and a great accompanying orchestra. I think I had such a great experience because I really went all in with my boyfriend in making it a date night. 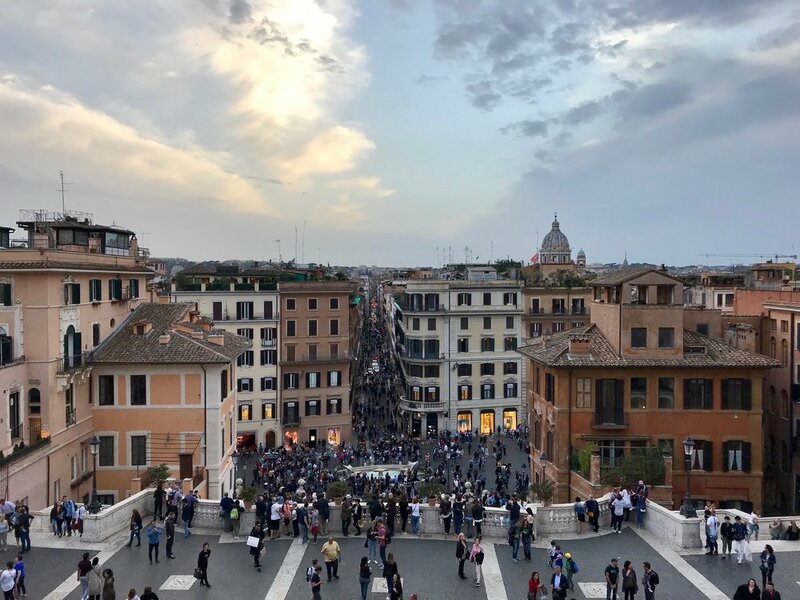 We dressed up (something that happens rarely enough for us), grabbed an appetizer/drink before and took a walk around the center before the show, heading from Piazza Barberini to the Spanish Steps and Piazza della Trinità di Monti. We left plenty of time to grab our seats before the show started (really important if you want a good seat) and it was a fun night all around. I really enjoyed the show itself from start to finish, with my only possible issue being the length. Obviously with a three-act opera, it makes the show longer and La Traviata ended up being about 3 hours from when we got in and took our seats to the end. As it was completely in Italian, I bought the book that the organizers offer for €2 and followed along line-by-line in Italian and English because I like knowing exactly what’s going on, especially with the dialogues. Most people seemed to be more relaxed and simply enjoyed the music and singing without having to understand everything (and even my Italian boyfriend didn’t catch everything because it’s much more difficult to understand the conversations when they’re being sung). All in all, it was a great first opera for me here, especially because I felt so involved being close to the stage and the story was simple enough for me to keep up with. Obviously if you fall outside of these categories but are interested anyways, you should still consider attending! These opera shows are scheduled for Tuesday, Thursday and Saturday nights, all going from 8:30 pm to around 11:00. *This post is not sponsored in any way. 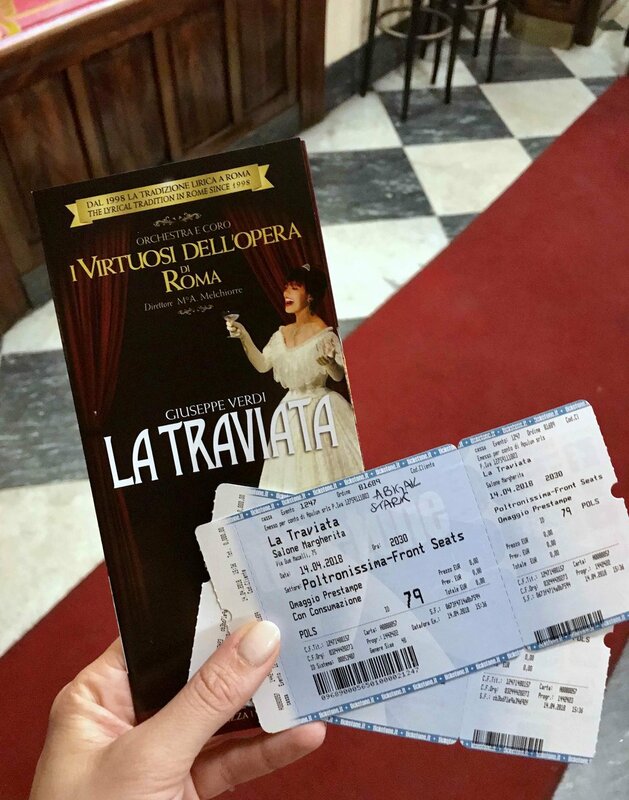 I was given complimentary tickets to show by i Virtuosi dell’opera di Roma but that has not affected my overall opinion and what I shared about my experience.